Teaching students to learn their name is one of the first words they will learn to read and write. It is such an important part of the Kindergarten curriculum and it should be fun! In these reading and writing centers (name games) your students will not only practice their own names, but their friends names as well. Watch how students begin spelling anyone's name they can, including yours! Writing names. Write each student's name on card stock and laminate. Students practice writing names with dry erase markers. Sentence starters. Give students sentence starters, such as, "I like _______________," or "This is ________________." Students find their friend's name and place it on the sentence starter, then copy the sentence onto writing paper and illustrate. Or give student this sentence starter: "My name is ________________," then have students fill in their name and rewrite the sentence on writing paper. I like to write each word of the sentence starter in a different color. You can read more about in my article about writing words in different colors to assist early readers to learn word recognition. Name puzzles. Write students names on seasonal shapes according to your theme. Cut shape into two puzzle pieces. Students take turns matching the name puzzles. Students will need to have access to the word wall or a name chart. Color names. Print student names very large on paper in yellow highlighter. Students trace their name using three different colors. Beginning sound. Write student names on a sheet of tag board, excluding the first letter. Students make the sound of their beginning letter and make it with glue. The sprinkle glitter over the glue letter. When dry, compare beginning sounds with other students. Alphabet blocks. Write student names on blank name tags or sentence strips. Students find and count the letters in their names using alphabet blocks. Letter search. Students search through magazines and cut and glue the letters in their names onto paper. This can also be done for last names or friends names. Word Wall. Students go to the word wall and copy friends names for a personal word wall. 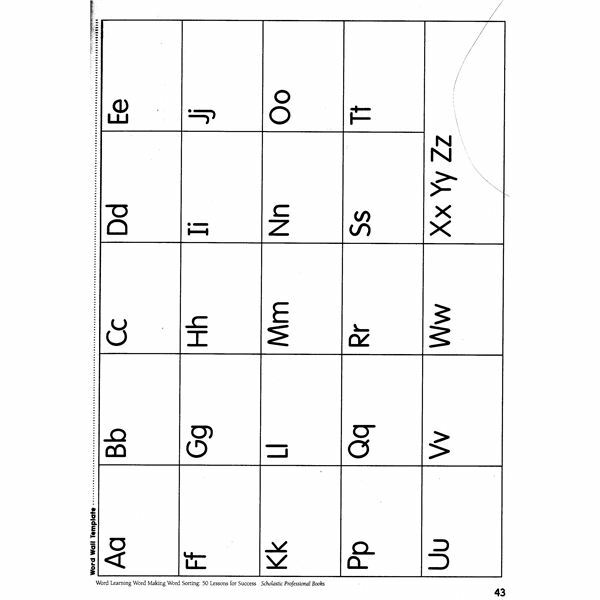 Provide a blank alphabet chart for them to do this (sample below). Sort names. Given a class list, students sort names by beginning letter. Letter sort. Students sort each letter of the alphabet by whether the letter is in their name or not. ABC books. Create ABC books for writing and learning letter sounds. Students write each other's name on the correct page in their ABC book. I have also written an article on making an alphabet book for each student. There is a download in the Bright Hub Media Gallery to print the ABC letters. This is also an idea for an end of the school year assessment. Have the student write a friend's name in the alphabet book at the beginning of the year and again at the end. Write on tracing paper. Here is a website (one of my favorites) called, My Moon Drops for free tracing paper. Type in each student's name so each student can get personalized practice printing his or her name on the lines. Reconstruct names. Cut apart the letters in the student's name and place into a baggie with his or her name on it. Have students glue their name back together in the correct order. Write a song. Copy the special star song (refer to the star of the day name lesson plan below) into a poetry notebook using their name. Sign in. Have students sign their name on an attendance log each day. This also turns into a great progress report. Play the Name Game online. AvensWorld is a website where students practice spelling their names and is self-correcting. The teacher types in each student's name for independent practice. Students will enjoy the engaging practice with these games. Before you know it they will be adding names to their papers during writing workshop to enhance their stories. It's a launch into the wonderful world of words. All activities are provided by Laurie Patsalides based upon her classroom experience teaching names.